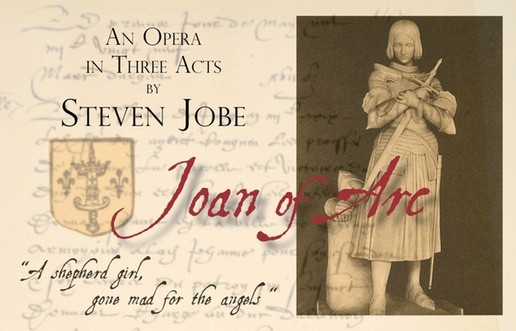 Joan of Arc, an opera by Rhode Island composer Steven Jobe, was produced the first time as a fully-staged opera in May, 2010 at the Blackstone River Theatre in Cumberland, RI. Tess Wakim, who enjoys an internationally successful career as soloist in the opera, oratorio and chamber music, played Joan of Arc. Jason McStoots, a renowned vocalist from the Boston area, played the Dauphin. The opera's composition is a compelling blend of old and new -- medieval melodies and harmonies in a context of modern tones and instrumentation. Two exotic instruments are included in the score: ' Cloud Chamber Bowls' (unpitched glass bells) developed by composer Harry Partch, and the ' Drone	Machine,' a 7-foot long hurdy-gurdy type instrument developed by Steven Jobe.